I am always open to reading new material from a variety of authors. 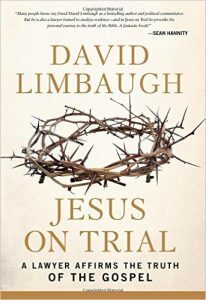 I have been interested in seeing and hearing David Limbaugh (the brother of the well known Rush) on television and radio because of his conversion to Christianity and his effective witness in those public forums. This is a 2014 book on apologetics as Limbaugh has studied and understood it, and quite effectively being a lawyer himself. All in all, I think this is a good book, especially for lay people who are interested in better understanding the important issues surrounding their faith. It is much better than Rick Warren’s Purpose Driven Life, which was little more than an extended gospel tract.